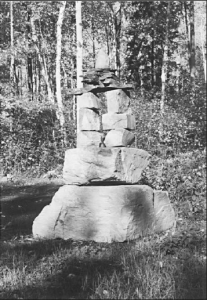 This Inukshuk is here to remind adventurers not to forget your navigational aids, such as: compass, GPS, walkie-talkie, Cobalt 31 M/5 1:50,000 scale topographical map. This trail runs through protected martin habitat (i.e., old growth forest). To access it hike around Bay Lake Shore from the North Portage behind the white cottage, about 400 meters, and head inland along the Trail, about 4.5kms. In winter, this highland trail is tended by a prospector and trappers, goes overland through a red pine forest, past Edison Marsh, to a good dock near the mouth of Justin Creek. Access to Thomas Edison’s 1905 abandoned Darby Mine on the east side of Edison Mountain is gained by hiking up the Justin Creek Trail from the dock on Bay Lake. You will pass the abandoned Cobalt-Kittson Mine Head Frame (easily seen from Bay Lake) and arrive at Harold Watt’s atice prospecting camp, about 1 Km. Seek his permission and instruction to continue on the old mine road, about 1 Km, to the abandoned Darby Mine, Thomas Edison’s old claim. Thomas Edison, the world famous inventor of the light bulb, sought Cobalt for this battery invention in 1905. Caution must be taken adventuring around the many abandoned Mine Shafts & adits in this area. Bushwhacking from the mouth of Justin Creek Dock around the shore of the bay across Kitt Creek, about 500 meters, will connect you to a wonderfully maintained Cart Track from the Bay Lake to the Kittson Lake Hunt Camp & abandoned Mine Site on the West side of the Edison Mountain, about 2 Kms. Seek permission of the Camp before examining the adjacent mine artifacts and refilling your water bottles. Trout fishing in Kittson (Trout) Lake is excellent. Adventurers will have no trouble finding a large grassed camp site on Bay Lake Shore near the dock. Look in the bush at the row of abandoned vehicles obscured by the engulfing bush. Runs about 2 Kms, between Crow Rock Bay on Lake Anima Nipissing, over the height-of-land, past the unmarked & dangerous Crow Rock Mine Shaft (abandoned stibnite mine), down around beaver ponds, you’ll bushwhack around, to Bay Lake behind McVey’s Camp. Watch for leopard frogs in the ponds. The North Portage is the workhorse trail these days although both are nastawgan aged. Under Father Paradis’ instructions this trail was “cut out” in 1891 to form a winter road from Bay Lake to Ferguson Bay, Lake Temagami, according to Dr. Barlow the original area cartographer. It is pretty, wide, well used, all seasons, 2 Km Portage between Crow Rock Bay, Lake Anima Nipissing over the height-of-land down to Bay Lake behind Emerald Island. Find camp sites at both ends. 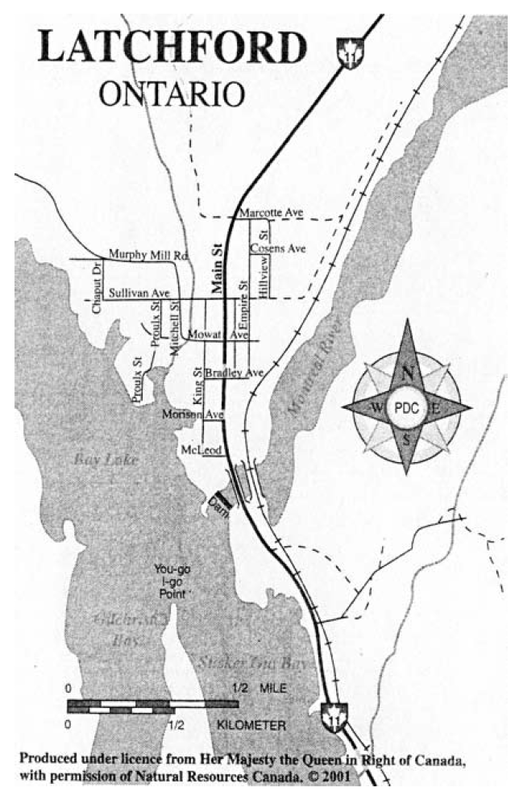 Bay Lake Shore has an old connecting trail heading toward the head of Bay Lake, Kittson (Trout) Creek and Edison Mountain. In Town find and travel memory lane along the old Cobalt Road (Town Map) heading north beside the ONR Tracks and accessible at the east end of the Marcotte Street past the Paintball venue. 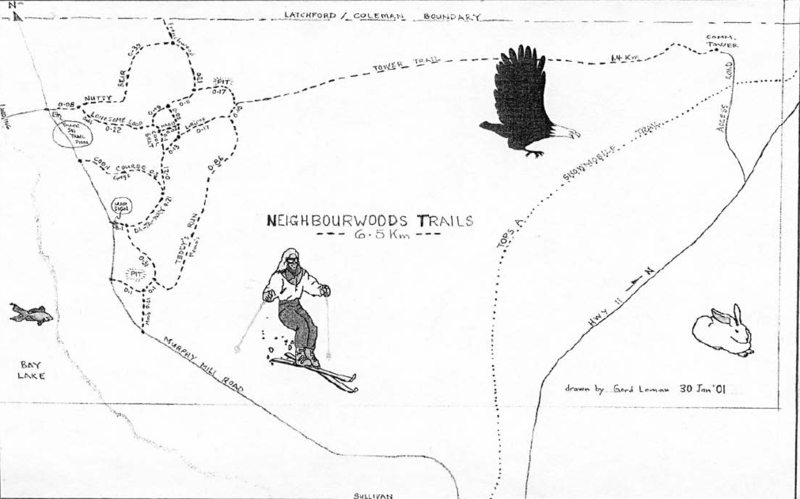 Also in Town try Neighbourwoods Trails (see Map) History buffs should ask for the self directed walking tour Guide titled ‘A Historic Walk Through “Sawdust City” (Latchford) by George L. Lefebvre. Bay Lake access at Coleman Creek mouth or at the Lake Anima Nipissing, Burnt Bay or land access at the intersection with the Burns Trail near the outlet of Coleman Lake. It’s about 4 Kms in length with a good picnic spot at the outlet of Coleman Lake. This is one of the 6000 year old native trails (meaning a Nastawgan Trail) also used for hauling pine logs over the height of land to the Ottawa River before the saw mills were built in Latchford. In summer, look for artifacts from bygone times. In winter, try ice fishing. Coleman Trail is mostly used in winter now. (ref. 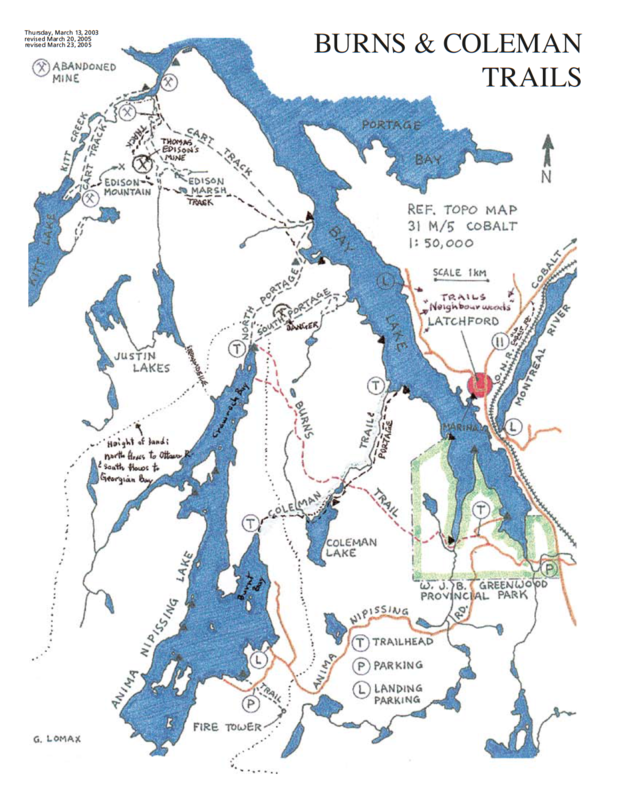 Craigh K. Macdonald’s Historical Map of Temagami). From Hwy. 11, go about 1.5 Kms west along Anima Nipissing Road (park here) and turn right on W.J.B Greenwood Park’s only cart track (goes to a large camp site on Bay Lake). About 200 meters down this track the Burns Trail Head on your left heading toward the mouth of Gilchrist Creek and cross it at Bay Lake. Up the Creek a short distance the trail turns west out of the valley. You will cross Woodpecker Creek (a side trip up which you would find an isthmus/ moraine bisecting Woodpecker Lake which is of national scientific interest, an artifact of the last ice age) heading over the height-of-land toward a Trail Head at Crow Rock Bay on Lake Anima Nipissing about 6 or 7 Kms to the north west. There is a good large campsite here. Over the years Burns Trail has been used by miners, lumberjacks, campers and these days by hikers, snowmobilers, hunters and trappers. This is a transition forest revealing the species (young to old) at the northern edge of the Great Lakes St. Lawrence Forest and those of the southern edge of the Boreal Forest. The plateau on top if typical moose country. Be prepared to ford beaver dams and circumnavigate marshy terrain. Latchford is central to hiking activities in the Temagami District. It is the Gateway to the exciting bold new Ottawa-Temiskaming Highland Trail (a Nastawgan Trails Inc. initiative… stay tuned to www.nastawgantrails.com. South of Latchford 3 Kms and east along the Roosevelt Road a new highland trail is being mapped out joining exisiting trails at Rib Mountain Conservation Area and Beaver Mountain at Lake Temiskaming where the Ottawa-Temiskaming Highland Trail starts south toward Mattawa. Turning west of Hwy 11 onto Anima Nipissing road, 3 Kms south of Latchford, in the undeveloped W.J.B. Greenwood Provincial Park provides access to the Anima Nipissing Fire Tower Trail and the Burns Trail. The Burns Trail intersects the ancient Coleman Trail and connects other trails to the north-west. Latchford is considered an important terminus in the Temiskaming Trails Corridor. Connecting Latchford to Temagami in the south and Temiskaming Shores to the north is in the new cards. Latchford has access to very old trails and exciting new ones both in and around the Town. Neither Roosevelt nor Anima Nipissing Roads are plowed in winter but parking lots next to Hwy 11 are kept clear, etc… www.ottertooth.com, Cultural & Landscape Guide Map, South Temiskaming Area by GeoComp, Norman & Marilyn Hawirko. Park at the third turn-around on the last road on your left before you reach the government dock on Anima Nipissing Lake. Look for a red blaze and hike the groomed path up to and climb the Tower for a photo op of a spectacular view of Maple Mountain to the west and Rib Mountain to the east. Takes about 20-30 minutes. Across the road, hike the old trail to the Lake to find the original large campsite for a picnic and swim.